Life is a canvas and the colour of letters, thoughts, dreams,knowledge, experiences enhance its beauty. The rising sun brought a sparkle to her eyes. She got up, rushed through her morning ablutions and got ready for her first day at school. The patch work ridden frock did not dampen her spirits. Didn’t that ‘chechi’ from the Tribal Welfare Office say she’d get new clothes once she joined school? They sang out in a chorus. Neeli rushed out and joined the milieu of uniform clad girls waiting at the entrance to her dilapidated hut. The frail half-clad figure at the rickety door let out a sigh of relief, wiped a tear and held up a hand to bid goodbye to the little girl. The figure slowly receded into the dark confines of the crumbling walls, poured out the remains of the thin rice gruel at the bottom of the pot into an earthen bowl and gulped it down. Taking a sickle she slowly moved out and headed for the thick forest in search of firewood and food. “How much more do we have to walk?” Neeli asked the girl walking by her side. Her legs were aching and tummy rumbling in hunger. The bowl of rice gruel already digested on account of the long trek to school, Neeli felt her body go limp. Looking around she found some berries on the wayside bush. She plucked and popped in a few. Chewing on the berries she remembered the ‘chechi’ from the Tribal Welfare Office. What had she said? Yes, she’d promised her mother that Neeli would get two wholesome meals at the school. The very thought of stomach-full of rice brought a smile to Neeli’s lips. She rushed forward and joined the others. The small white -washed school building looked like heaven to Neeli. She entered the school premises with new hopes and new aspirations. She knew that if she could stick on here, life would never be the same again. The ring of the morning bell saw the school break out into a chaos. Swirls of dust were blown up as the children rushed to form a queue for the morning assembly. Neeli joined them. 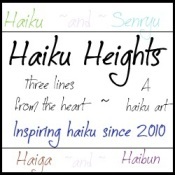 “Are they going to give us food now?” she asked the elderly girl standing behind her. A giggle broke out. Neeli wondered what was so funny. Neeli nodded in affirmation. The prayer seemed to drag on endlessly. Neeli’s tummy rumbled. The words leaving her mouth seemed meaningless. The only thing she could think of was food, food and food. A bell rang heralding the end of assembly. The little legs scampered behind the tall girl to the dinning shed. Elbowing her way through the milieu of students Neeli grabbed a plate and ran to catch a vacant space in the hall. The hall was a virtual ‘fish market’. Voices screamed over one another. Students vied with each other to catch vantage spots. But Neeli was lost in the steam emanating from the big, thick vessel holding ‘upma’. The wait seemed endless. Finally the ladle made contact with her plate. The hot, steamy upma looked like manna from the heavens. Neeli dug her fingers into it. The heat in the stomach was hotter than the heat emanating from the ‘upma’. Neeli savored each morsel. Going in for a second helping she wished she could take back some for ‘Amma’. The thought of ‘amma’ brought back memories of the cold hearth and the thin rice gruel. Neeli decided she’d study hard. The lure of free food and free clothing was strong enough to make her want to stick on. “Burp! Burp!” Neeli wondered what it was. This had never happened to her. Eyes wide she looked around. The girl sitting next to her let out giggle. Neeli looked at her with questioning eyes. “That’s a signal. Your stomach is full,” the helper from the kitchen explained. Neeli gave her a smile. “I’ve never eaten so much,” she said. “Study well and you won’t be wanting for food,” the lady said. Getting up Neeli headed for the wash area. Class was fun. Neeli learnt a few things and made a few friends. The hours to lunch time flew. The bell rang once again. Little legs scampered to the dining shed. Neeli joined them. The hot steamy rice, the dal curry, okhra dish and a ladle of curd left Neeli in awe. She gulped down the entire serving in just a few minutes and asked for more. “Burp! Burp!” Neeli smiled. A silent ‘thank you’ left her lips . Was it for the heavens, was it for the hands that prepared the meals or was it for the ‘chechi’ from the Tribal Welfare Department? School over, the trek home was faster. Energized and excited, Neeli rushed ahead of the others. Paru waited at the doorstep to receive her young girl. The sparkle in her eyes, the smile on her lips was infectious. Seeing her happy face the drooping sad eyes crinkled at the ends. A smile broke out on Paru’s face. Quickly lighting the hearth she made a glass of black tea, took Neeli in her lap and gently patted her head. The next hour was spent on catching up on school and more importantly on the menu served out there. That night Paru and Neeli had a sound sleep, one happy in the thought that her darling would not have to go hungry henceforth and the other happy at not having to nurse an aching, hungry tummy. 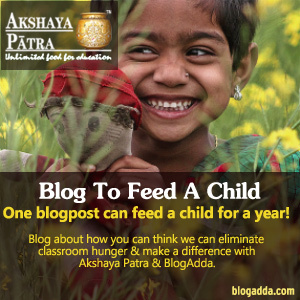 I am going to #BlogToFeedAChild with Akshaya Patra and BlogAdda. Are you a blogger? Then do join the initiative. Your one blog post can feed a child for a year. Isn't that great! Do let me know you've been here. Leave your thoughts in the comment section below. © Geeta Nair and 'Canvas,' 2013.. Powered by Blogger.